A new chemical reaction to aid the synthesis of low-dimensional polymers that can be rationalized as phthalocyanine derivatives was recently developed by a collaborative team of researchers. One team worked under professors Pau Ballester and José Ramón Galán-Mascarós at the Institute of Chemical Research of Catalonia (ICIQ) while the other team at the Institute IMDEA Nanoscience was led by Dr. David Ecija. Their findings have been published in Nature Communications. Surface-mediated synthesis of low-dimensional polymers involves the use of simple molecular precursors. This is now considered a rapidly emerging field. In this research, the team use surface-confined thermally tunable reaction pathways as a route to choose intermolecular versus intramolecular reactions that provide either low-dimensional phthalocyanine polymers or monomeric phthalocyanines, respectively. The polymerization of the molecule occurs when the temperature increases up to 275ºC. It then results in phthalocyanine one-dimensional polymers (phthalocyanine tapes) that had not been synthesized until now. However, the polymeric growth is blocked when the temperature increases to 300ºC, and the precursor is converted into individual phthalocyanines. This selectivity brought on by temperature, regardless of being a promising approach for enhancing the synthetic versatility, had never been applied on surfaces so far. Nevertheless, this application may have huge benefits when nanostructures with technological applications are engineered. 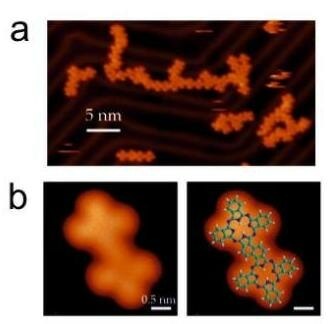 On-surface synthesis is a promising strategy for the formation of nanostructures. This new thermally controlled reaction presents a very interesting alternative for the development of new polymeric materials, which will satisfy the growing demand from disciplines such as nanotechnology, information technology and biotechnology.